Friend: "Remember bud, as long as your chest sticks out further than your stomach, you’re all good!" Me: "Please, please pipe down"
That’s how a short, yet thought-provoking conversation went with a good pal of mine recently. It got me thinking back. 2008. It was my final year of school and the rugby season was in full flight. Always an exciting, yet stressful time. To play on the Senior Cup team was a great honour and something which many school memories hinge off. To be brutally honest, I thought it was the be all and end all! Wrong again. During that time I can’t say I enjoyed the gym much, simply because I never knew what to do. To add to this, a deep fear of injury would decrease any chances of making the Senior Cup team. Stuff of nightmares ay?? When I did go, I often just resorted to benching. Safe bet, just don’t go too heavy, wouldn’t want to cause a scene! During break time on one particular day, I sat in the canteen enjoying a plate of chips. I had no intention of joining a few of the lads who were training in the school gym during the lunch hour. Incorrect, I would be joining them momentarily. Next thing I knew, the double doors leading into the canteen swung open and the team's head coach stormed in. Nameless he shall remain! The eyeballing from a distance had turned into me being dragged (by my tie may I add) along a row of full tables where my fellow students sat, through the canteen, into the gym and parked next to the pull-up bar. SWEET JESUS. I knew what was coming. ‘As many as you can - GO’ he barked. Now this was the real stuff of nightmares. I completed 1 and a half reps in my uniform in front of my friends and broke out into a ferocious sweat. Message received. I had work to do! Shaky. But he got there. The recovery process of sitting and slurping kicks off again before its time to repeat the ordeal. Harry leaves, bench presser stays. This happens. It does. I don’t mean to focus solely on one movement here. YouTube fails provide hours of farcical and frightening clips of dodgy deadlifts and squats which are still waiting to be stood up. This is not an onslaught against barbells, powerlifters or anything else. I'm just here trying to help you refocus your fitness goals, get you moving and to ensure you don’t neglect the basics. Having spent the last few years working in a gym environment there was a certain pattern which I want to bring to light. When it comes to basic bodyweight movements, many if not most of us, struggle massively! Squats, lunges, push ups, pull ups and hinging. They are all challenging, yet fundamental movements which as a human you may require at some point throughout this life we live. With the gents, the term ‘pull-up’ sets off gasps and groans that are deafening. With the ladies, ‘push-ups’ always seem to be their nemesis, often facepalming before I had finished saying ‘up’. I’m right there with y’all, I don’t necessarily get excited for pull-ups, and push-ups burn out quick as a flash. To improve, they require constant practice; same goes for mobility and anything else performance based. And that’s a good thing! Repetition is the mother of skill. The sense of achievement someone gets when they complete their first pull-up or push-up is a joy to see. Or perhaps you’ve been training for a while, and you can complete a set of 10 reps. If you can do that, you are in the minority here on planet earth, to have the ability to do so. So, hats off. The great thing about basic movements is you can actually do them anywhere, even right now, so why not? Grab your mate beside you in the office, in college, or wherever. How do your push-ups fare? Remember - you gotta crack eggs to make an omelette, so keep moving! 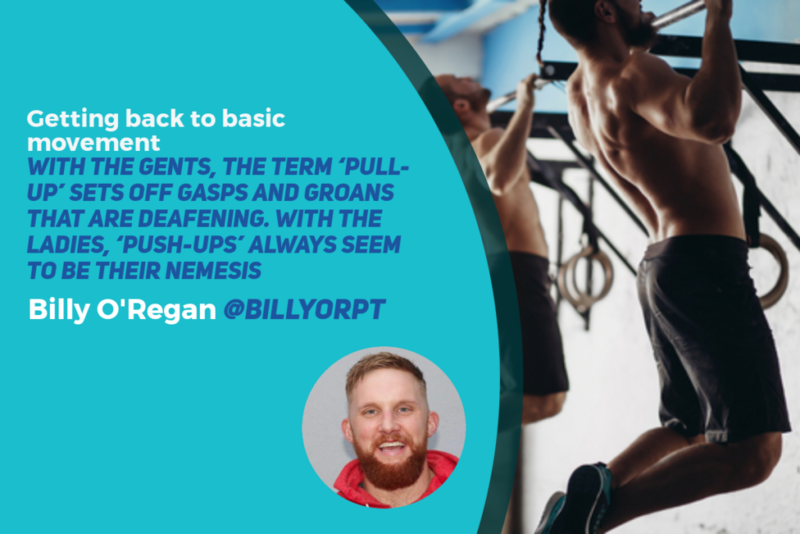 Billy O’Regan is a strength and conditioning coach in Cork City. He has been working in the fitness industry for the best part of 10 years. During this time he completed a BSc in Food Business. He helps people to achieve their fitness goals through enjoyable group training and online coaching. With a passion for all areas in health and wellness, he is currently studying a Masters in Strength and Conditioning where the main focus is athlete development and sports performance. Train Smarter, Train Better Part 3: Let's Get Technical!